With the recent announcement of a $1,000 bonus to its employees, sustainable investors might wonder if Walmartis becoming more labor friendly? Are the bonuses a meaningful gesture? Or just a well-timed sop to curry favor with the Trump administration and its much (and rightly maligned) tax bill? At first, I thought the timing of the announcement to be pure political sophistry. Or, from another perspective, a sound business tactic for a future quid pro quo from the White House. The bonuses will cost Walmart in the order of $300 million, which is not nothing. But the effect of it all looses some steam when you learn the one-time bonus was destine only to those with 20 years of uninterrupted service . Other employees were eligible on a sliding scale, down to $250 for those with 2 to 4 years of service. This means less than 20% of the company’s 1.5 million US-based employees will receive a full bonus. All good, I guess. Until you realize only 40% of employees will receive any bonus at all, and that the cost of the bonuses to Walmart is less than 3% of its 2016 profits and a fraction of years of tax savings come. Will Walmart Bonus Employees Every Year? Walmart also recently announced a coming raise to its minimum wage, from $9 to $11. Great right? At those wages, a single full time Walmart income household of four would still hover around the poverty level (Walmart considers 34 hours full time). A family with two full time Walmart incomes would fare better, earning 20% more than the poverty income of $30,070. 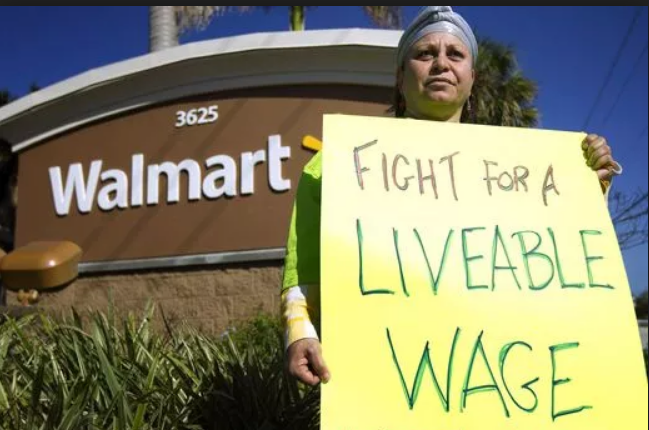 Let us not forget, that a substantial portion of the company’s employees don’t work full time (note: Walmart doesn’t make public the number, perhaps because they pay part-time employees 50% to 30% less, and offer them fewer benefits ). This year may be a bit better for some employees thanks to the bonus, but unless the company pays the bonus every year, puts more people on full time, or dramatically raises the minimum wage, its penury for those who depend on Walmart income. Generously Putting People Out of Work? Walmart announced pretty much the same day as the bonuses that it will close 63 Sam’s Club wholesale stores across the country. This will cause 11,000 people to loose their jobs. The company also said it will shed another 1,000 corporate level jobs. Smelly timing? My kids do this all the time, look Dad, I got an A on my exam…. hoping i don’t check what is really in their school bag. Just saying. As a public company, Walmart’s actions are relatively transparent. It is also target of much derisive labor, environmental and governance activistism, much of it deserved if you operate from a sustainability perspective, some not. That said, its perfectly legal to shed employees and close stores. Personally, I don’t like cheap stuff. It increases consumption, and because most of the stuff in Walmart is not high quality, you end up buying things over again when it breaks, fades, or quickly wears out. My creed is: “I am too poor to buy cheap.” We also need to consume less. So Walmart is not in my portfolio and I rarely shop there. I also found the ingenious use of the Trump tax break entirely offensive. This only enables the thoroughly thoughtless and disgraceful president. Ditto Carrier, ditto Bank America, ditto other companies who did the same. Are all these companies so desperate for a good presidential tweet? I will not jest about the many low-income folks who feel that shopping at Walmart is the only way to make ends meet. There are options, but when you have little, easy and cheap can be attractive. Many higher income people shop there because they like cheap stuff. To them I say, its a free market, but do so knowing the enduring paradox of Walmart: if you do shop there, you are telling the company it is OK to do unto others things you may not want done unto yourself or family (e.g., paying poverty wages). If you don’t like what cheap stuff does to the world, you may not want to shop at Walmart or invest in their stock. Ditto if you don’t like the way Walmart treats their employees. If consumer goods assets are important to your portfolio allocation strategy, there are many other stores to invest in. Popular options include Costco and Canadian Tire. For more information on sorting your sustainability investment choices, check out my new book Invest Like You Give a Damn, available at New Society Publishers and Amazon. Note: I am not recommending any of the companies mentioned in this article for your portfolio, and I recommend you consult an professionally accredited sustainability adviser for any investment you may be considering. Contact me if you need an adviser. ← Investing in BIG OIL? Be Sustainable & Get OUT NOW!